One of the greatest pies of all time, pumpkin pie, in a sheet form that you will be able to eat for days after the big Harvest dinner. I love pumpkin pie like I've said in several of my other blog post. I could eat pumpkin pie or pumpkin spice anything 365 days out of the year. Its just the perfect kind of pie. Pumpkin pie happens to be my families favorite pie as well and we never have anything leftover from Harvest dinner and we don't have any left to eat with out left over ham or turkey. That is why this year I decided to make a slab pie. I have already made other pumpkin spice or pumpkin post in the last couple of months. You should go check this out. 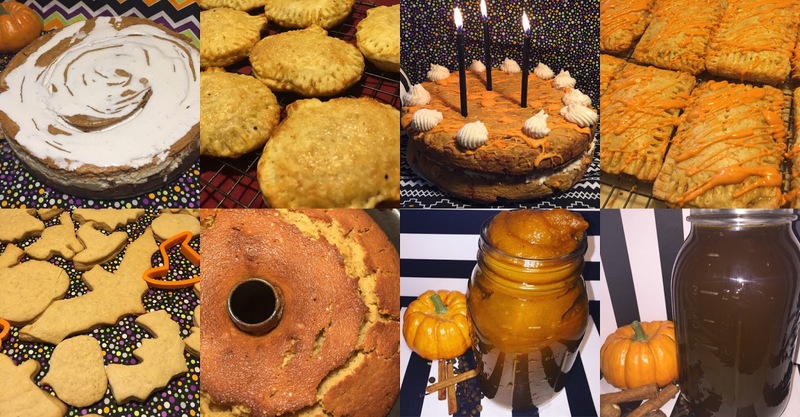 Marble Pumpkin Spice Cheesecake, Mini Pumpkin Hand Pies, Pumpkin Spice Cookie Cake, Pumpkin Spice Cheesecake Pop Tarts, Pumpkin Spice Sugar Cookies, Pumpkin Spice Pound Cake, Slow Cooker Pumpkin Butter, Pumpkin Spice Syrup, and Pumpkin Spice Extract. 1. In a large bowl, combine flour, sea salt and sugar together. With a box cheese grater, shred the four sticks of butter into the flour in the large eyelet side. 2. Gentle incorporate the butter and flour mixture together with your hands. Slow add cold water 3 tablespoons at a time until dough can hold together. 3. Divide into two halves and wrap in cling wrap. Chill in the refrigerator or freezer for at least 2 hour or overnight. 4. In a separate bowl, whisk pumpkin puree, vanilla extract, spices, brown sugar and sea salt. 5. Slowly add one egg at a time to the pumpkin pie mixture then add in milk. 6. Roll chilled pie crust out with a little a flour. Transfer pie crust to nonstick 10 by 15 medium size cookie sheet or jelly roll pan letting a little of the crust hangover the side. Press a fork along the edges and place crust in the refrigerator. 8. Pour pumpkin filling into prepared pie crust and bake for 25 to 30 minutes or until filling is just set. 9. Let pie cool for 45 minutes to 1 hour before serving on a wired rack. This looks so delicious! ...and easy to make, and a definite crowd please...perfect for Thanksgiving! What a lovely pie. Can't wait to try it! I am a big pumpkin fan as well! This is perfect for Thanksgiving. Wow, this looks absolutely delicious! My mouth started watering just reading about it! Thanks for sharing! Thanks for sharing your love! We love pumpkin pie in our household too and I am eager to try this recipe. It is creative and looks delicious! I loooove pumpkins so I will really need to try this out. thank you for sharing this recipe! Your collage of treats all look amazing! I love how these are shaping like pumpkins. :) Keep contributing to my sweet tooth! Love pumpkin pie and I like the idea of making it in a rectangular pan- more pie which means more leftovers for later! I am not a fan of pumpkin pie, and yes I knew from your previous post that you are. My family the husband and the kids all love pumpkin and love the fall season for that reason. So even though I don't like it I try to make them snack or desserts with it. This seems simple enough that I could do and even get the children in on cutting the pumpkin cut outs. What a yummy recipe. Will try and make it over the holidays. Thanks for sharing.! Your recipes always look so delicious! I will eat ANYTHING pumpkin. it's amazing though that I haven't made any pies yet! My son loves pumpkin, this will be a perfect treat for him. It looks so easy to make, I will give it a try tomorrow. This looks great - perfect for this time of year. Love the pumpkin pastry detail! My whole family loves pumpkin pies! This would be perfect for big parties. wow this sounds really a good idea to bake with pumpkin, I never tried it before this sounds exciting. I'll surely try it at home and see if I can make the same result (hope it'll be delicious as well) thanks for sharing! cheers! Pumpkin pie is my absolute favorite!! I can only imagine how great it would be to have an entire sheet of pumpkin pie! This is such a unique twist on pumpkin pie! Plus it's much cuter and can feed a larger crowd. I'm not a huge fan of pumpkin pie, but this looks SO delicious! I love the cute little pumpkin decor on top of it! Pumpkin pie is the best. It's super yummy. I love they way these turned out! It's a great treat for this time of year and looks fairly easy to make. Wow, that is definitely a pie to feed a family. This year I am considering making mini pies since we are not having company but I will have to keep this in mind for the years when we are hosting. there's nothing like a pumpkin pie this time of year! This recipe looks and sounds so delicious! Can't wait to give it a try! Love this recipe...easy to follow along and will definitely satisfy everyone! This looks really good! like the recipes (not the first time I came across this website). Only thing missing is some shots from the making itself. Like breaking the eggs and stuff like that. more artistic pictures can really be a nice touch. 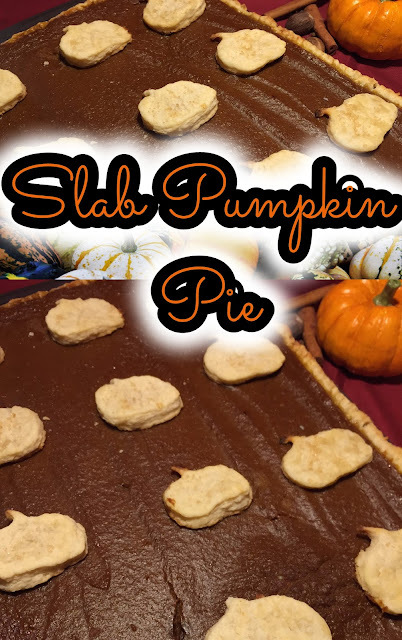 This Slab Pumpkin Pie looks so delicious and really tempting. Perfect for children treats this coming Holiday. I will share this to my friends. This Slab pumpkin pie looks delightful and really tempting. Perfect snack treat for kids. For sure they would love this so much. It look delicious!! I love pumpkin pie (y) Thanks for the step by step instructions. This looks so amazingly delicious! My kids love having pie so i would definitely try this out.